Millions of people from all over the world visit Niagara Falls each year to take in the beauty of the magnificent Horseshoe, American, and Bridal Veil Falls, and experience world-class accommodations, entertainment, dining, and shopping. And while the rushing waters of Niagara Falls are spectacular to see during the day, the illumination of the waterfalls at night is unlike anything else. 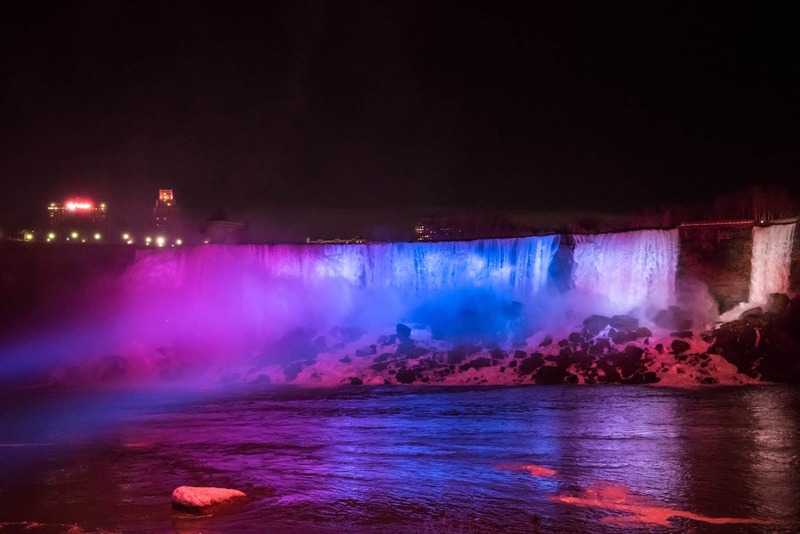 This year, the Niagara Falls Illumination Board has invested in making the nightly illumination of the Falls even better for visitors with the addition of four million dollars worth of LED lights. These new lights use approximately 60 percent less energy than the old ones and cut right through the mist to provide a striking and colourful illumination experience. Niagara Falls have been lit up at night since 1925, which has made the illumination into a long-lasting and beloved tradition for both locals and visitors to see. And now is a great time to experience the brand new lights as the city’s annual Winter Festival of Lights is currently on and other exciting local events are fast approaching, like the Niagara Falls New Year’s Eve Celebration in Queen Victoria Park.